You may want to take the best prenatal vitamins on the market for a healthy pregnancy. You want your baby to get all the important nutrients and that’s where prenatal vitamins come in. Even if you’re eating a healthy diet, there may still be nutrients that you are missing. Taking a prenatal vitamin can also prevent anemia and neural tube defects. Thus, we have compiled a list of the best prenatal vitamins 2019. You can ask your doctor to see if he or she has recommendations for prenatal vitamins. Your doctor may give you a prescription prenatal or you can purchase the below over-the-counter vitamins. Nature Made prenatal vitamins is one of the best prenatal vitamins with DHA. It’s for women who are pregnant and those who are trying to get pregnant. This liquid soft gel multivitamin provides 200mg DHA, an omega-3 fatty acid, folic acid, iron, and other necessary nutrients all in one, easy to swallow softgel. DHA may help support fetal brain and eye development. If you take this, you don’t need to take a supplement for omega-3s. They ensure absorption of key nutrients and provides all 8 B vitamins as well as fat soluble vitamins, such as vitamins A,C, D, E and K. Nature Made Prenatal vitamins contain no added color, synthetic dyes, artificial flavors, preservatives, yeast or gluten. Some women have reviewed these Nature Made vitamins to be one of the best prenatal vitamins for hair growth. They notice that their hair thickened and their nails hardened. 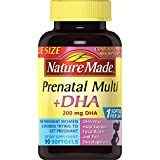 Nature Made also has Multi Prenatal Tablets without DHA. 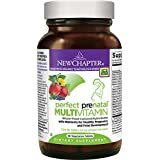 New Chapter Perfect Prenatal Vitamins is one of the top rated prenatal vitamins on the market, perfect for pregnant women and those planning to be. What’s unique about these vitamins is that they are the first prenatal vitamins to be made with certified organic vegetables and herbs, Non-GMO project verified, vegetarian, kosher, sugar free, gluten free, no synthetic fillers, no animal gelatin (which some prenatal gummy vitamins contain). These multivitamins are different because they’re fermented with beneficial probiotics and whole foods. They do not have any artificial flavors or colors added and can be take on an empty stomach. New Chapter prenatal vitamins is one of the best prenatal vitamins with folate to support healthy development of baby’s brain and spinal cord. Unlike prenatal gummies that have no iron, these have the essential non-constipating iron for healthy red blood cell production. They also have B vitamins for natural energy support, vitamin D3 for heart support, vitamin A, C & zinc for immune support. These vitamins are one of the best organic prenatal vitamins with whole-food ingredients. The ingredients used in these vitamins include organic Superfood Sprouts such as broccoli, cauliflower, and kale. For prenatal DHA, take New Chapter Prenatal DHA – Wholemega for Moms Fish Oil Supplement. 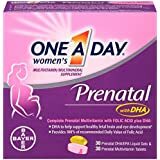 The One A Day Women’s Prenatal with DHA is one of the best prenatal vitamins before pregnancy. These multivitamin supplement for mom and baby before, during, and after pregnancy. It provides 100% of the recommended daily value of folic acid and iron, which helps to carry oxygen to the fetus. These One a Day multivitamins also have adequate iodine, which the American Thyroid Association recommends that pregnant and lactating women should get. This package includes 30 Prenatal Multivitamin Tablets as well as 30 Prenatal DHA/EPA liquid gels. This means you do not need to take any separate vitamin for DHA. 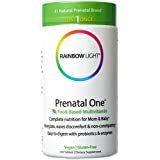 Rainbow Light Prenatal vitamins, one of the best over the counter prenatal vitamins, is a food based multivitamin. It is easy to digest with probiotics and plant-source enzymes. It energizes and eases discomfort with non-constipating ingredients. They are vegan and gluten free made with natural, purity tested ingredients. They do not contain any artificial preservatives, flavors, colors, sweeteners or other additives. They also do not have any animal ingredients, wheat, sugar, shellfish, nuts, dairy/lactose, soy or yeast. Some women have commented that these Rainbow Light vitamins are one of the best prenatal vitamins for hair and skin, where it has helped their skin improve and become more clear. 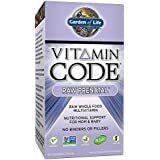 Garden of Life prenatal vitamins are made from nutritious raw whole foods. These vitamins includes probiotics, vitamin D, zinc and ginger for digestive support. They have the necessary iron, vitamin B-Complex, C, E and folate for healthy neural tube development. These prenatals are designed for both mom and baby during pregnancy and lactation. Garden of Life vitamins are one of the best prenatal vitamins for vegetarians. These raw multivitamin are vegetarian gluten free, and dairy free. These CONCEPTION prenatal vitamins are one of the best prenatal vitamins for PCOS. Women with PCOS or polycystic ovary disease syndrome have a harder time getting pregnant and are at higher risk for miscarriage. This makes it even more important for them to take prenatal vitamins. These fertility vitamins help to regulate your menstrual cycles, balance hormones, aid ovulation and battle PCOS. They are 100% vegetarian and completely free of fillers, binders, and artifiial ingredients. They do not contain gluten, wheat, or dairy. They are easy-to-swallow soft capsules. 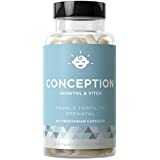 You can get these on Amazon and each order has a 90-day 100% money back guarantee so you can try Conception vitamins risk-free. 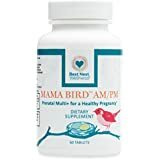 Mama Bird AM/PM is one of the best prenatal vitamins for morning sickness. What’s unique about these multivitamins is that it only has methylated vitamins, such as natural folic acid, natural B12, and natural B6. Mama Bird prenatal vitamins are easy to swallow and gentle on an empty stomach. They do not contain soy, fish/shellfish, yeast, preservatives, sugar, artificial colors and flavors, nuts, GMOs, or dairy/lactose. Mama Bird AM/PM prenatal vitamins are perfect for prenatal, IVF, pregnancy, postnatal and breastfeeding mothers. 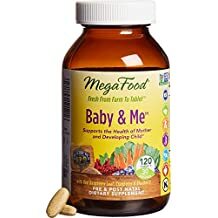 MegaFood Baby & Me prenatal vitamins have a herbal prenatal blend with organic ginger to support strength, mood, balance and nausea during pregnancy. It is gentle on the stomach and can be taken anytime, even on an empty stomach. It has real foods such as organic broccoli and brown rice, which help support lactation and healthy development with biotin, vitamin E, and folate. 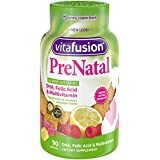 Vitafusion has one of the best prenatal gummy vitamins. They provide the essential vitamins and minerals for pregnant and lactating women. Each serving contains 100% DV folic acid and50 mg Omega-3 DHA. They are an excellent source of Vitamins A, C, and D. In fact, they have as much Vitamin C as 10 tangerines. These fruit flavored gummies do not contain iron, making them easy on the stomach. This also makes them one of the best prenatal vitamins for nausea. However, because women need iron during their pregnancy, taking a supplement without iron may cause you to become anemic. If you want to take these vitamins and do not want to risk becoming anemic, you may want to consider taking an iron supplement. 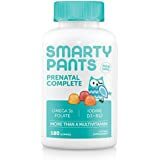 SmartyPants prenatal gummy vitamins is one of the top prenatal vitamins with 15 essential nutrients such as folate, iodine , vitamin D3, vitamin K2, DHA and EPA fatty acids. Vitamin D3 and vitamin K2 are critical nutrients, as they work together to regulate calcium absorption and support bone health and skeletal structure. Its Omega 3 fish oil is from sustainable stocks of wild-caught small fish. Smartypants gummy vitamins is Non-GMO and free of eggs, milk, peanuts, tree nut allergens, fish allergens, soy gluten, wheat, and shellfish. There are no synthetic colors, artificial sweeteners, and artificial flavors. If you plan to breastfeed, you should take postnatal vitamins after your baby is born. Your body will still need the additional nutrients as you produce milk. Since your milk will nourish your baby, it is essential that you get the necessary nutrients to ensure that your baby gets them as well. Some of the above vitamins mentioned in this article can be used as prenatal and postnatal vitamins. For example, One A Day vitamins and Vitamin Code Raw Prenatal vitamins can be used for post pregnancy as well. Other vitamins only work as prenatal vitamins. For example, New Chapter has a different multivitamin for postnatal, called New Chapter Perfect Postnatal Vitamins. Nature Made also has Nature Made Postnatal Multi-Vitamin Plus DHA Softgels. These postnatal vitamins support your changing needs, including vital nutrients to support breastfeeding. Ideally, you should be taking prenatal vitamins when you are trying to conceive. Prenatal vitamins are essential to supporting your baby’s development. It is recommended to take a multivitamin with folic acid daily for at least 1 month before pregnancy, so you can start as early as you are trying to conceive. You will also need omega-3 fatty acid DHA, which some prenatal vitamins include, such as Nature Made Prenatal Multi + DHA. Otherwise, you will have to take a separate pill for DHA. DHA transfers directly from the mother to the fetus during pregnancy and helps support fetal bran and eye development. Your body will need enough iron, especially since the body’s need for iron increases during pregnancy. Iron helps support the increase in blood volume, metabolism, and cellular energy. In addition, it helps carry oxygen to your growing baby. It is also important to get enough folic acid, as it reduces a mother’s risk of having a child with a bran or spinal cord birth defect. If you are expecting twins, you do not need to look for the best prenatal vitamins for twins because you actually don’t need a special vitamin. The above prenatal vitamins are perfect, whether you are having one child, twins, or even triplets. However, women expecting more than one baby may need to take an iron supplement, as they are at higher risk for iron-deficiency anemia during pregnancy. Your doctor should be monitoring your iron level to ensure that it is sufficient. If it’s not, your doctor may recommend that you take an iron supplement. Taking prenatal vitamins is one of the simplest things you can do for your baby. You just need to remember to take it daily! This entry was posted in Labor and Delivery on October 12, 2018 by admin. A frequent question many new mothers ask is, “What should I pack in my hospital bag for delivery?” Packing your hospital bag for delivery might sound stressful but preparing ahead of time will help you feel more at ease. It’s recommended to pack your hospital bag several weeks before your due date, since you could go into labor early. You don’t want to wait until you feel a labor contraction to start packing. Pack two separate bags – one for you, and one for the baby. Packing early will help you save time when you feel ready to go to the hospital. This way, you won’t be scrambling to gather your belongings and forget to bring something important to the hospital. Below are checklists of what to bring to the hospital when you deliver. Marriage certificate or acknowledgement of paternity if you are not married – Some hospitals require you to bring your marriage certificate so that you can register your baby’s birth certificate. Birth plan, if you have one – This is just a guide for the hospital staff, so keep your birth plan short. Remember, delivery plans can also change. Nightgown, bathrobe, slippers, socks – Hospitals will provide gowns and socks for you to use, but some women prefer to wear their own. If you choose to bring your own, make sure your gown is sleeveless or have short, loose sleeves so your blood pressure can be checked easily. A bathrobe and a pair of slippers may come in handy if you want to walk around the halls. Bring items that you do not mind getting dirty/ruined. Pillow – Some women prefer to bring their own pillow. If you choose to do so, bring a patterned or colorful pillowcase so it doesn’t get mixed up with the white hospital pillows. Toiletries and other personal items – This includes hairbrush, toothbrush, toothpaste, shampoo, body wash, towel, lotion, lip balm, hair scrunchies, etc. Maternity underwear and extra-absorbent sanitary pads – The hospital will provide but you may want to bring your own in case you don’t like the ones that the hospital has. Comfortable going-home clothes – You will still need to wear a maternity outfit going home. Remember, you’ll still look six months pregnant so you won’t be able to fit into your pre-pregnancy clothes just yet. Snacks – You might need an energy boost mid-labor and after labor. You may find it helpful to have some crackers and granola bars with you in case you get hungry in the middle of the night and the hospital cafeteria is closed. You don’t want to send your partner out scrambling for food. Cash and change – Bring some change in case you want something from the vending machine. A going-home outfit – Bring socks and booties if the clothing doesn’t have covering for your baby’s feet. Bring a blanket and extra clothing layers if it’s cold. Make sure your baby’s outfit has legs (not a baby gown) so the car seat strap can fit between them. If you are delivering in the winter, you may want to bring a snowsuit. You’ll likely receive a receiving blanket and a hat from the hospital but you can bring your own if you want. Car seat – This won’t fit in your hospital bag, but you will need to have an approved car seat to take your newborn home with you. It’s crucial that you have a rear-facing infant car seat installed properly in advance, even before you go into labor. Learn how to install an infant car seat and read these car seat safety tips. Extra wipes and diapers – The hospital will provide them but you may want to bring extra. There are plenty of advice and checklists for mothers to pack to go to the hospital, but fathers may also want to bring a bag with their own essentials. Pillow – You may need to grab some sleep in a chair so having your own pillow will help you feel more comfortable. Toiletries – You may want to bring your own toiletries, such as your toothbrush and toothpaste, to freshen up in case you need to spend the night. Cash and change – Bring enough money for food and parking. Cell phone and charger – It may be helpful to add your partner’s contacts to your phone so that you can easily call her friends and relatives. White or restricting clothing – Pack comfortable clothing. Each hospital is different and provides different items for babies and mothers. You can call your hospital to see what they provide and take those items off your list. If there is anything else that you can think of that you might need, add it to your own checklist! Bring whatever makes you comfortable or helps you relax. Remember, you are not going away on a vacation so you don’t want to overpack. The hospital room may also be small. If there are items that you think you might need but are not essential, you can always leave it in the car. This entry was posted in Labor and Delivery on October 31, 2016 by admin.